How can you see emotional abuse? In my first proposal, I was so sure that my project was going to start some type of movement. I was overly ambitious and I could truly say that this project has humbled me with the understanding that Rome was not built in a day. With my project, I hope to bring more awareness to emotional abuse. One of the challenges of identifying emotional abuse is that there is no physical evidence. When I first started planning my project, my focus was on how to empower the victim of emotional abuse. I thought that having something that can identify emotional abuse would be helpful to the victim. My first thought was to create a cuff that would light LEDs in response to certain words that an emotional abuser would normally use to abuse the victim. That would have included coding that was beyond my understanding, so I had to simplify. This did began a path on deciding on what would be my sensor. I had worked before with LEDs in a previous project so I felt comfortable with using them as my actuators. Now, I must inform you that I had never use coding or didn’t even have clue what an audruino lily pad was before I took this class. So of course my anxiety level was at the max. I did however felt a little confident in making the product because I have sewing experience. But it only took me so far. I know I wanted to play with audio because emotional abuse is verbal so I had to figure out how I was going to get information from a sensor to the LEDs. That’s when the USB lily pad came into effect. We had already played with it in class so I felt a little at ease, and it was on less thing to order. So the supply list was due, and for some reason I thought the LEDs that came with our kit was suffice. By this time I still did not decide on what would be my sensor. I found an audruino recorder online but I still did not know what route I wanted to take this project. After a discussion with professor Knight, I committed to a theme for my project. Within this discussion, I also was able to identify my sensor. Fortunately, a student from a previous class allowed me to see what she had used for a similar project that involved audio. We used a recorder that also measure sound levels and with this I was then able to output through the Lily pad to the LEDs. Perfect right? I decided to use my project for media art. I was going to construct a mask that would light up to a video of an abuser verbally abusing a victim. I wanted to show a visual effect in spite of the lack of evidence to promote awareness. Now a mask would involve contours of the face so the conductive thread seem ideal for one of my tools in putting all of this together. While my recorder was being shipped to me, I was brainstorming on how to design the pattern of the LEDs that will be sewn on the mask. I only knew about serial patterns due to a previous project. I’ll tell you later about this challenge. The recorder came in the mail and I was so excited to start playing with it. Now how will this be possible without sewing everything on the final product, the handy dandy gator clips. They saved my life. I was able to connect everything and practice coding without making a permanent mistake. Okay next challenge, the recorder was too small to keep the gators on so it was causing a short. This resulted in a crash course in soldering. 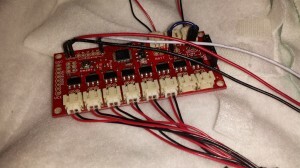 I learned to solder jumpers to my recorder and then I was able to connect to the lily pad and LEDs by using connecting wires which come into play later in another challenge. Okay so I’m back in business. Coding. What can I say about this subject? Please read everything that professor Knight suggests. I had to crammed pages and pages of literature while I was coding. I mean that’s how I learn ( hands on) but it would had been helpful to have read everything while we had our workshops. I can’t stressed that enough especially if you are new to any of this. I learned my lesson. Fortunately, after reading everything, I was able to figure out that the code that came with the recorder was something I can build on. One thing I encountered was that I would have my GND, VVC, and SPL not connected to the right output, so if you see that something is not working(flashing) correctly double check the wiring. Once this was pointed out I was able to connect. Another problem I encountered was that my board was not selected correctly in audruino so if there is something funny showing up in your serial monitor double check the bottom of the audruino sketch pad. This was also pointed out to me by the same student assistant. God Bless him. With the help of his guidance, I was able to get the coding in a day, but then something else happened. Remember I pointed out that I only knew about serial patterns, well I learned about parallel first hand. My LEDs’ charge was not strong enough to carry through in serial so I had to go parallel. So how was this going to be a possible pattern and on a mask? I made a decision to only make my neck band that was going to housed all the equipment my only tech functional piece. Now it’s time to construct. I learned to strip my wires because I used jumper wires to connect my recorder to my lily pad. This is where the wires come in. There was no way I would be able to connect all my LEDs to one GND. I resorted to radio shack again and invested in a stripper and a LED strip. The best investment was the stripper. My whole aesthetic change to accommodate the design. I decided to “wear the Guts out”. I incorporated the equipment to the design. My wiring draped like chiffon! I used tacking to keep the wires in place. The end results was awesome. I was able to connect at least three LEDs to my GND by using the wires I stripped. Since I decided to use the equipment as part of the design I was able to keep everything in range and the neck band wearable. I kept my design somewhat the same and I now like the new aesthetic. 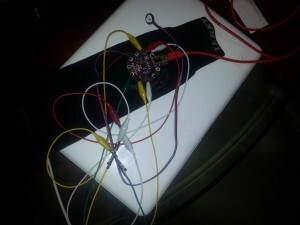 My coding works and its wearable and I can return the $30 LED strip to Radio Shack. This was a challenging journey. This experience was awakening and I have a new profound respect for e-textiles. I learned a lot through trial and error and my product is functional. I hope that it does do what I intended it to do, overall the journey was worth it. Hopefully this will help with giving a visual effect to emotional abuse. 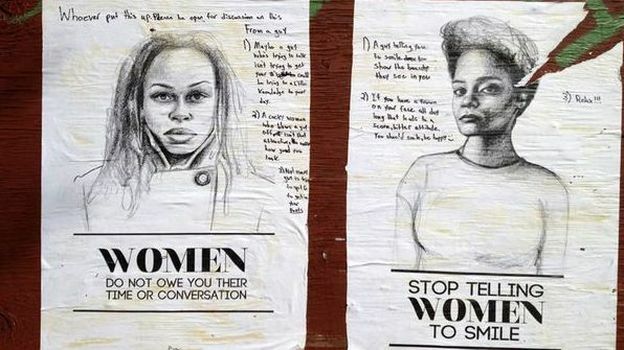 Stop Telling Women to Smile is the public art project addressing gender based street harassment by Tatyana Fazlalizadeh. When saying, “I’m not interested,” is no longer a clear enough signal to leave someone alone. My project concept was to create a device that would allow people suffering an anxiety attack to alert people around them of their impending attack. The device checks a wearer’s pulse and alerts those around the person when the pulse increases. I know this sounds oddly familiar. If you’ve ever been on a treadmill you know that there are heart rate monitors that will do this for people working out. My device isn’t much different than a heart rate device. The difference is the intent of the device. My device is meant to address issues in the mental health arena. I’ve lived with people who had anxiety attacks and there is no way to know the person is suffering unless they tell you. The idea behind my device is to give the person wearing it and the people around them to understand what is happening. When I started this project I had anxiety. I am not adept at sewing or coding. The first thing I had to decide was what I was going to create the device on. I decided a cuff or bracelet would work, but I decided to use a sleeve. You can buy sleeves at REI. I owned workout sleeves. They are exactly as they sound they are sleeves without shirts. They fit by using elastic on the openings to grip the skin of the wearer. The sleeves cost roughly $25. 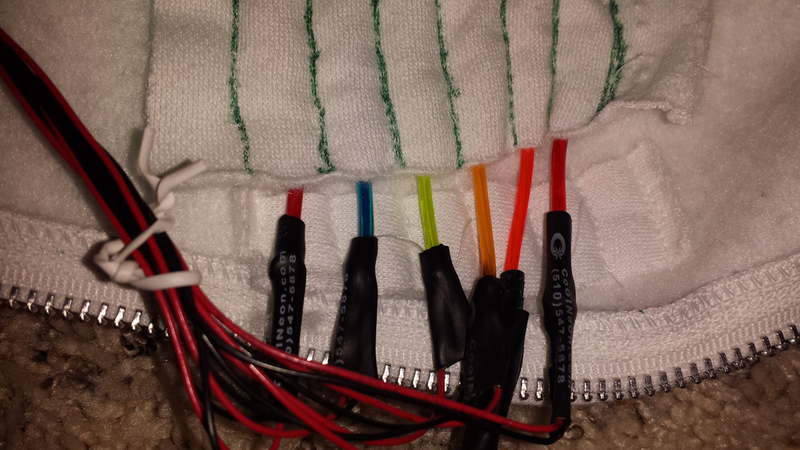 Once I got the sleeves it was time for me to layout how I wanted the LilyPad and LED lights would be set. I bought the Sparkfun stickers. I laid them on my sleeve to configure everything. I originally bought gum drop looking LED lights, but they didn’t work for what I was doing. I did want the person wearing the device to alert those around them that they were having a panic attack, but I didn’t want the sleeve to alert everyone in the room. The gum drop LED lights were to obvious for my project. I chose to use the LED lights that came with the Protosnap and the one extra LED light that comes with the LilyPad. Electric Paint Pen with Conductive Ink is a pen applicator full of conductive paint.You can paint on all different surfaces to create a circuit, although you shouldn’t try it on your skin. The pen ink will conduct electricity. I also bought because once I painted my original circuit I could paint over the original paint to blend into surfaces or add other elements to the circuit. This pen saved me so much sewing time, although I am grateful for it I don’t think it was the right thing for me. At the time of this writing I haven’t hooked up my pulse sensor. Prior to hooking up the sensor I had to pain my circuit. The first time I did it I made the lines too thin and they broke off immediately. The second time I used the pen I put my hand in the sleeve and the lines broke again. I tried to keep the sleeve on my arm and draw the lines, but once again the lines broke. Finally, I decided that since my sleeve is a prototype I wasn’t going to put my hand in it and I laid down thick lines between the LilyPad and the LED lights. In class today my paint snapped so I have to start over. Also, I figured out that my pulse sensor is made as a plug and play for the Arduino UNO – yikes! Needless to say today was a setback. I removed all the paint from the sleeve and my instructor, Kim Knight, gave me wire glue to use. I think it functions the same as the paint, but it may be more durable on bendable fabrics. I plan to connect my Red, Purple and Black wire tonight and let them dry overnight. I let the paint dry overnight and I couldn’t get any of my LEDs to light so I set everything together with Alligator clips. Now, the LEDs work, the pulse sensor lights up now I just need to get the code right and I will be on my way. This thing will not be beautiful, but I hope it works. Throughout my first semester as an EMAC major, the topic of “value judgments” has somehow managed to come up in discussion at least once (often multiple times) within every course that I’ve enrolled in. A value judgment, in the context that I am referring, can be defined as “an estimate, usually subjective, of the worth, quality, goodness, evil, etc., of something or someone..” In other words, it is placing judgment upon something (or someone) that you really don’t know anything about, without regard for the point of view of others. This topic is one that I’ve always felt strongly about, and I’ve learned through multiple discussions at UTD that many other students feel the same way. But somehow, regardless of the fact that no one seems to agree with placing value judgments upon one another, people continue to do it anyway. It is almost as if it is an instinctual reaction. So I decided to make a wearable media project that could somehow demonstrate how wrong these value judgments can be. The topic that I chose for these value judgments is music. Music is something that almost everyone can relate to on some level. Age, race, gender, culture, or geographic location does not affect whether or not someone listens to music or not. I personally have never met anyone in my lifetime that did not enjoy some form of music. My 82 year old Czechoslovakian grandmother sure does love her polka albums! But she also won’t hesitate to tell me that the music I listen to is just worthless noise. Value judgment alert! Music stirs our emotions. That’s why we listen to it. But we’re all individuals who have led different lives and had different experiences. So it only makes sense that it will take different types of music to stir each unique individual’s emotions. This sounds simple and logical enough when you read it, right? But I’d be willing to bet that it wouldn’t take you more than a few moments to recall a time when someone you know (or maybe even you) has placed judgment on the music that someone else listens to, because it just sounds like “noise”, and for whatever reason, some people automatically deem anything that they do not like as worthless, without regard for the fact that it could be worth so much more to someone else. So I’ve designed a jacket that visually displays the emotional value of music that is played in its vicinity. Deciding exactly how to gauge this value was difficult. My lack of medical training prevents me from plugging anything into the wearer’s brain for a completely accurate reading. And my financial restrictions kept me from being able to implement something simpler, like a heart monitor, to read emotional response. So I was limited to only implementing a microphone to “hear” the music, and I depended on information gathered by others about how the rhythm or beats of music affect the brain and how brain activity increases when musical stimuli becomes more intense (or loud). I then used symbolism to visually link these rhythmic brain responses to emotion with a sequence of electroluminescent wires that light up with the rhythm and intensity of music the microphone hears. This method worked well for me. I’m a writer, and somewhat of a literature buff, so I think the whole world revolves around symbolism anyway. The most difficult challenge for me during construction was the interference from the inverter to the microphone. Electroluminescent wire only responds to an alternating current. But the microcontroller, an EL Sequencer, runs on a direct current. This requires a DC to AC inverter to provide power to the EL wires. This type of inverter generates a high pitched squealing noise. It is barely audible to the ear, but the microphone seemed to always pick it up. I even tried moving the inverter as far away from the mic as possible, but the amount of interference didn’t seem to change at all. So I believe that the interference is actually coming through the wiring in the circuit. I tried using different types of wire, as well, but this also did not help. 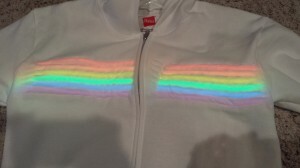 As for the overall design of the jacket, I made several choices based on symbolism and aesthetics. I chose a rainbow (ROYGBV) sequence for the EL wires. Rainbow is typically associated with happiness, and while not all music is happy, it does emotionally fulfill us in some way, and that makes us happy. I wrapped the wires around the chest because the heart is the part of the body that we generally link our emotions to. I decided having the wires on the outside of the jacket was too harsh on the eyes and not very visually appealing. So instead I decided to place them on the inside of the jacket, and chose white as the jacket’s color so that the light could shine through more easily. This also gives the appearance of a diffused internal glow, instead of a harsh outer one, which I thought to be more fitting for a symbolic representation of emotion. In conclusion, my project was ultimately a success. I’d definitely be much happier with it if it didn’t need to be reconfigured before each use. But it works, and as someone who had literally zero coding OR sewing experience before Fashioning Circuits, that’s all I could possibly hope for. Pia Myrvold is a Techno-Fashion Designer who we’ve touched on a few times this semester, and I think creations similar to hers were the inspiration behind my most recent project. Something about fashion and high-tech devices is simply too interesting to resist! Quite soon I am convinced that we will see garments and accessories that can access WiFi, communicate via the internet, and even some with computing capacity. The future of fashion exists exactly as Pia has envisioned it and I simply couldn’t wait, so I built my own tech-fashion. The idea I came up with was tied into a piece of wearable fashion, but also serves to experiment with a social anomaly. As our society comes closer and closer to “absolute information awareness”, I’ve noticed that information security is becoming more and more important to our everyday lives. In the news, on the internet, literally everywhere around us people are trying to figure out what they can do to protect information that they see as personal. But what if we were forced to relinquish control over information? What if information was so readily accessible that someone passing you on the street could access it just by simply glancing in your direction? This is where VuMe comes in. 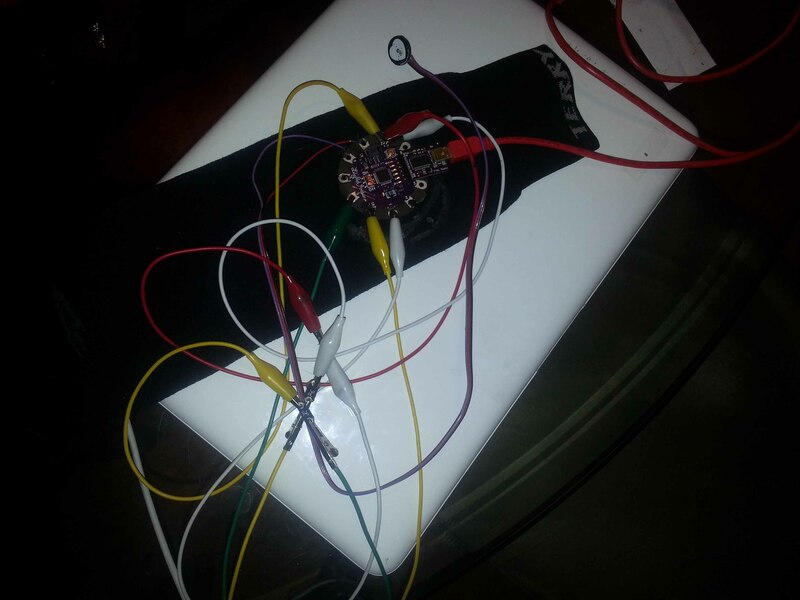 The project is an arduino based device, built into a wearable hat, that displays tweets for the world to read. Anyone can tweet information to be displayed on it, and when displayed ‘it’ will be on my head. So far the project has turned out amazing, and I’m hoping to add a smartphone app to go along with the design sometime in the future. The physical construction process was probably my favorite, and I’ve been fortunate enough to take a few interesting pieces of knowledge away as well. the largest of these was, ‘don’t think that you’re immune to mistakes’. As I was doing most of my sewing with conductive thread, forums that I came across online mentioned that the thread tends to fray easily. This causes a problem, because if some of the thread frays and touches another electrical components, then short circuits can and will happen. My response was, “I’ll be fine. I’ll just take my time sewing and I’m sure nothing will touch and short out…” Boy was I wrong. Creating a 5 x 8 LAD display by hand is fun, but will most likely end in multiple short circuits. Just because you’re careful, doesn’t mean you’ll be able to avoid it. But a neat trick to try: once you have the circuit properly in place, paint over the threaded parts, and the connectors in order to create a faux-seal. The paint drys, and acts as an insulator! (I used acrylic paint, please be careful to not use something flammable, or else your head might spontaneously burst into flames, consider yourself warned!). 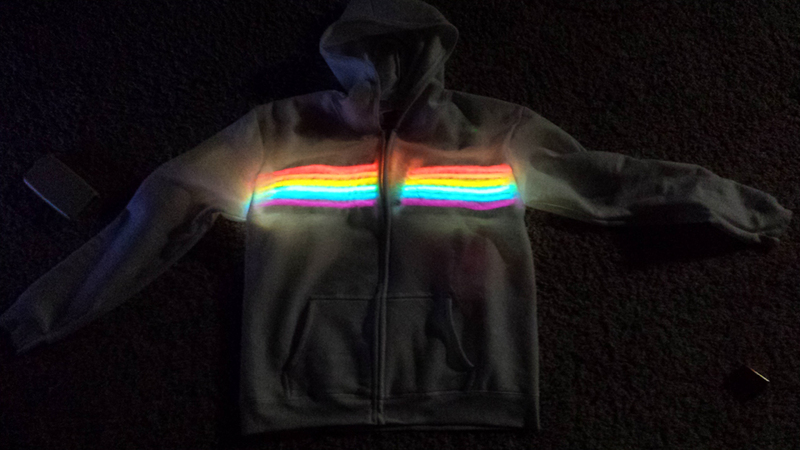 If you’re interested in making something similar to this, check out http://weekendhobbyist.blogspot.com/2011/01/arduino-lilypad-5×8-led-jacket-design.html for an example design sketch. Yep, this crappy CG video is not a last-gen computer game. This is a “simulation” of what the suit will do. Allegedly, according to an article on Mashable, the creation of the Tactical Assault Light Operator Suit – or TALOS – was inspired after a Special Ops officer witnessed one of his fellow soldiers dying while trying to safe a hostage. After the idea was born, the construction of a prototype was underway. A chemical engineering professor from the University of Delaware, Norman Wagner, decided to create the material of the suit out of nanotechnology, saying that it will be a liquid-like substance. Apparently, it will be light-weight and durable until it is hit, which it would then become very hard and tough. As the professor puts it, the reaction of being hit will cause particles to bunch together and form a protective layer. On top of this, the suit will have an exoskeleton, which will have attachable hydraulic arms and legs (for heavy lifting). AND it will have a visor with 360 degree night vision display, just because why the hell not… and to see any nearby enemies. I guess, for me at least, this kind of tech and wear is frightening. Sure, it’s fun to watch and read about Iron Man flying through the skies and taking out bad guys. But, and here comes the nerd part of me, the idea of Iron Man was that he funded and produced these types of weapons, and he is redeeming himself by destroying them. Off the topic of comic book themes, this huge progression in military tech is scary due to the increasingly powerful nature of these inventions. Sure, there are some huge benefits for the use of this suit: more protection, less lost lives, take out the enemy easier, etc. But what happens after this? Where do we go next? And what about the rest of the world? Are they going to just sit back and let the US make Iron Man suits and do nothing? Doubtful. This seems like another arms race. Granted, it’s not on a nuclear scale, but this is still crazy. I mean, this is just one small step at the moment. Where does it take us? I don’t know. I don’t have the answer for that. But I’m not sure if I want the answer right now. Fashion and emerging media have more in common than one might think. Both are constantly in flux and looking forward. Both are sites to negotiate and express identity. Both value originality, but also thrive on collaboration and appropriation. The two are explicitly combined in the realm of wearable media, which will be the main focus of this course. We will begin with a brief look at the history of fashion and its historical intersections with media and technology. We will then explore more contemporary areas of intersection centered on issues of identity and globalization. The final portion of the semester will be devoted to “learning by doing” in the production of socially-engaged and critically-informed wearable media projects. No sewing, electronics or coding experience is necessary. Become familiar with the basic social and ethical issues that connect fashion and emerging media. Write critical analysis of fashion and media theories and practices. Become familiar with the basic concepts of electronic circuitry, wearable arduino hardware, and the arduino programming language. Produce two wearable media objects. No prior sewing, electronics, or coding experience required. This semester in Fashioning Circuits, I was commissioned (re: required) to create a final project that exhibited the dual nature of fashion and circuits. Although I felt up to the challenge, I actually spent many weeks accidentally setting my project on fire and haphazardly learning about coding. It wasn’t all bad: I gained some new programming and sewing experience, learned a lot more about fashion and its intersections with sociology and my personal experiences, and also learned that I am capable of coming up with really cool ideas, even if they don’t exactly see the finish line. The premise of my project was simple: visibility. I wanted to use fashion to positively steer my personal representation in public; thus, the idea of a pair of light-up “twerking” short really appealed to me. I intended (and still intend!) to wear such shorts in a party environment where dancing was encouraged. The idea was to have the shorts light-up according to my movement: it would draw a lot of attention to me, but it would be on my terms (when dancing) and according to my comfort level. In part, the shorts would be a commentary on eating disorders and body image, being a Black woman in primarily Othering or hostile spaces, and empowerment via active and visible struggles against anti-Black misogyny. 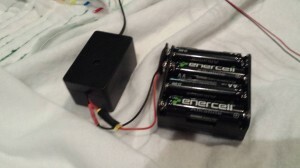 My plan was to use an accelerometer that would take in my movement and generate it into a current that would affect a LED light, so that the light would flicker faster or slower. Having several LEDs positioned throughout the skirt would create a fashionable aesthetic that would still adhere to the “stylistic” part of the project. 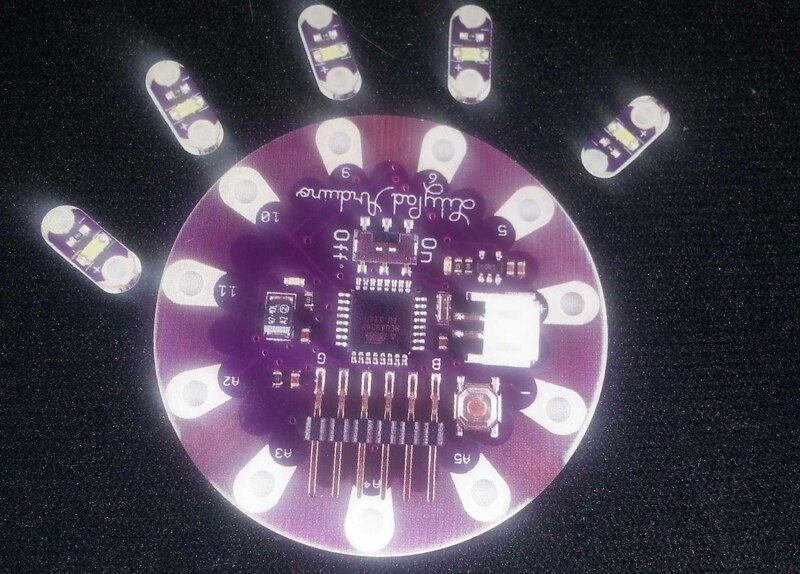 The circuitry would be moved by the Lilypad Arduino, a microcontroller board designed for wearables such as my project, and would serve as the brain of the operation. Unfortunately, I ran into a couple of complications, the main one being that my Arduino seemed to be damaged. While trying to connect the circuity to my skirt using conductive tread, my Arudino would constantly lose charge, catch on fire or stop responding to my laptop. In the beginning I was able to successfully program the Arduino, but overtime–and with many re-sewings, my Arduino began to suffer many scratches and eventually began to spark and catch on fire when the current was turned on. Another issue I had was successfully sewing the circuit together. Conductive thread requires that the wires do not touch, and I had to sketch out several placements in order to reach the right one. At one point, I’d have faulty wiring but was able to build a circuit; at another point, I had the complete opposite. Sketching helped some times, but was not able to award me with a complete circuit all of the time. My amateur relationship with conductive thread and programming also played a part in how well I was able to conduct things semester. Despite some shortcomings, I feel that I have definitely learned a lot this year. Programming has never been my strong suit (I’m a coding kind of girl! ), but learning about the Arduino software and its related code has helped me very much expand my ideas about coding. My sewing has gotten a little better too, as well as my technical knowledge and history of fashion. In the end, I would very much like to continue the product. I do believe my intentions are still important and would love to see the project come into fruition. I know this will definitely require better knowledge of programming and the Arduino, but I am very much excited to pick up the task.